“The world is full of magic things, patiently waiting for our senses to grow sharper.”, said W.B Yeats. We may not be proved wrong in stating that the protagonists in the ten twisted tales have a sharp sense considering the turn of magical events they are confronted with. Tina is an artist, her mother is proud of. But she isn’t. She wants to step out of the wheelchair she is confined to. She believes in magic and feels, that might add colour to the life she is currently leading. Thus she meets the girl in the picture taking Tina to a better world. Sheena and Nitin spend their summer vacation at their grandmom’s. Tarun is their neighbor there. The two boys have a gala time there climbing trees and playing football. Sheena who is left out finds solace in the attic. The attic awaits her with a tapestry of magic. The carpet does not carry her to distant places but shows her something strange where she is. When Alina and Mallika move to a new home they make startling discoveries. No just these, tales that are lined up are filled with magic. 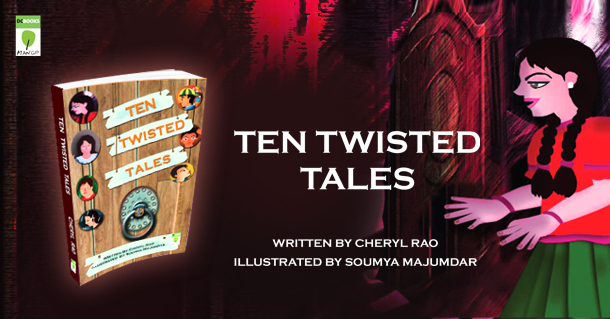 Ten Twisted Tales is a recently released collection of ten stories which will make you wonder and pinch yourself at the same time. Cheryl Rao talks about how magic works for one person and not for the other. The tales that make truth stranger than fiction as fiction may be because fiction is obliged to possibilities and truth is not!